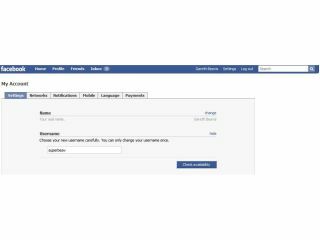 Facebook has relented and let users change the username they were supposedly lumbered with after a recent option for vanity URLs. Users foolishly chose random handles of lots of random letters and then promptly kept forgetting how to type it in again, or just simply chose stupid names and instantly regretted it. However, Facebook has allowed one more change of the username, despite stating the first time that this wouldn't be allowed. This option hasn't been made public, hinting that Facebook doesn't want the world to know its vanity URL plan didn't go quite according to plan. Just jump into your Facebook settings to change the username to something more palatable (unless, like us, you have a super awesome one anyway). Facebook is stating that this is the last time you can change the username... but we won't be surprised if we get a last, last chance in a few months time.